Most metal bands are in their element playing live. It's how they build the fan base and their reputation when they start out, and they thrive on playing live and the energy exchange between the band on stage and the audience. 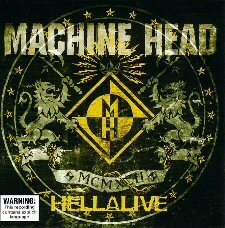 Machine Head are definitely one of those bands, and their new album entitled Hellalive is all about the live Machine Head experience. With the exception of two songs, which were recorded with Phil Demmel (Vio-lence, Technocracy) on guitar whilst on tour in Germany in July 2002, the majority of this album was recorded in London in December 2001 whilst Ahrue Luster was still in the band. The set list covers their entire catalog fairly evenly. Included here are some tracks that haven't seen the light of day in some time such as The Burning Red and I'm Your God Now which have been thrown in amongst classics such as Take My Scars and None But My Own. Working again with Colin Richardson (Napalm Death, Fear Factory), this is one of the best sounding live CDs around. Robert Flynn's persona as a front man really makes this disc feel like you are there. From his crowd interaction in between songs to his powerful vocals during them, this album captures you and makes you feel a part of the audience. Regardless of what you might think of their recent studio efforts, this is the album that reminds you of Machine Head's strength as a live act.